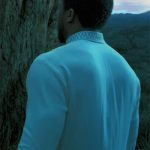 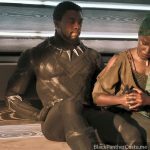 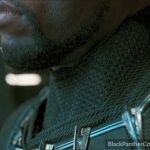 There were 4 Black Panther suits in the Black Panther film. 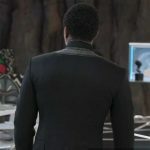 The first was T’Chaka’s suit in Oakland in 1992. 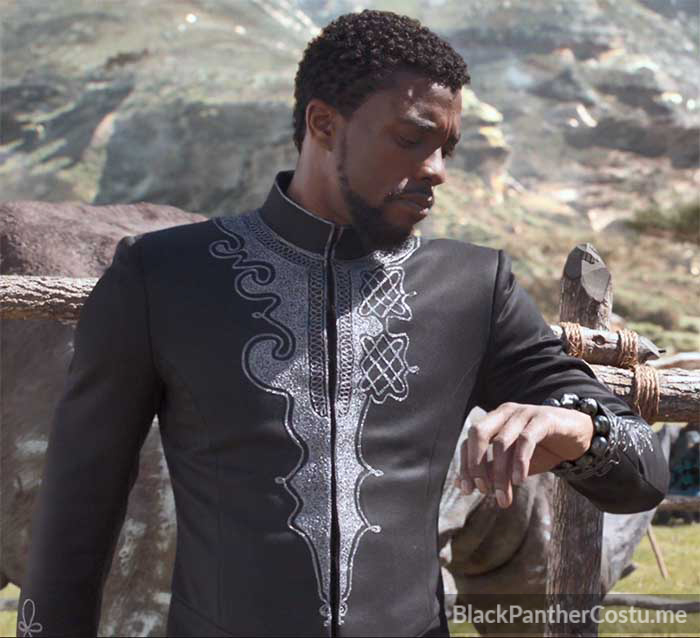 The second was T’Challa’s suit from the film Captain America: Civil War. 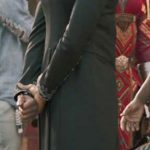 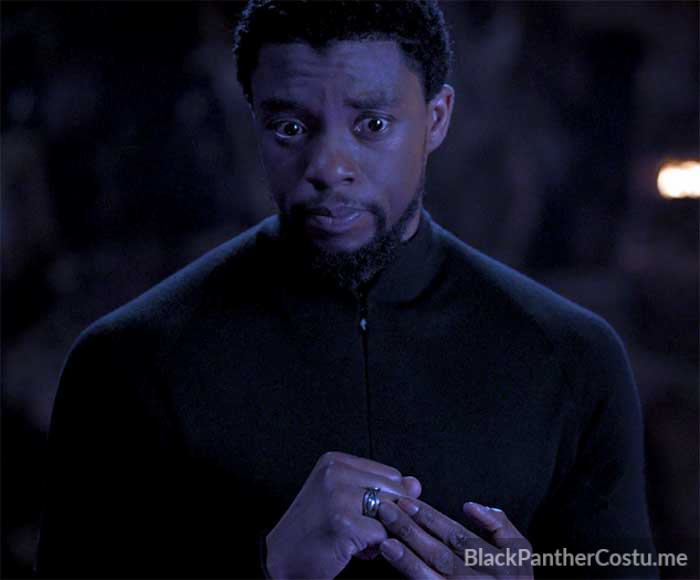 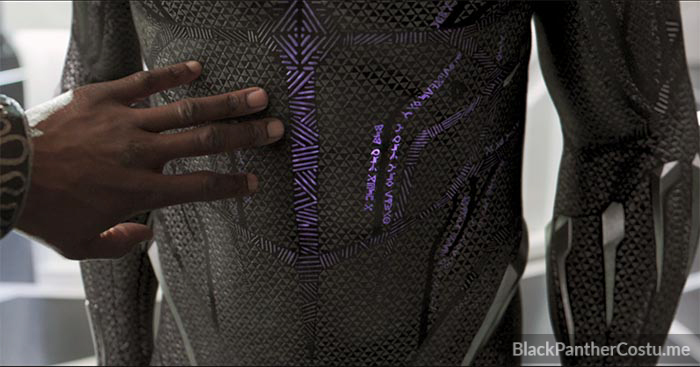 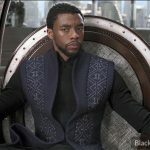 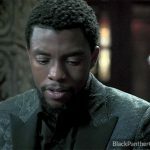 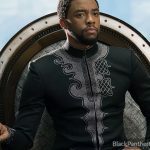 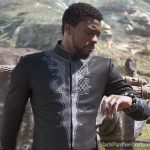 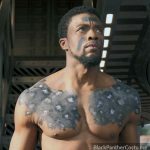 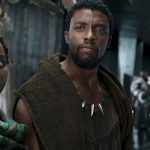 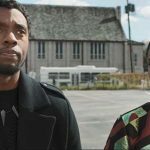 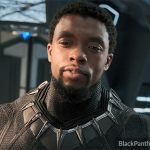 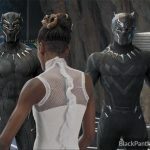 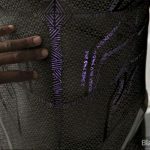 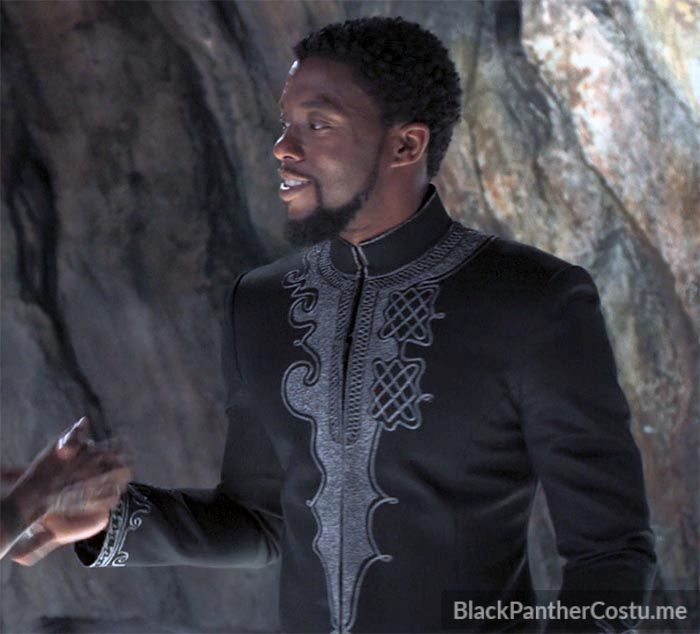 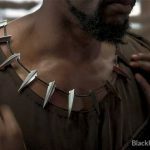 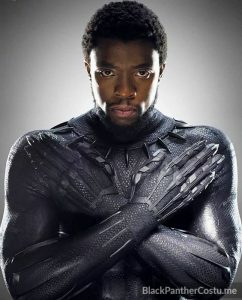 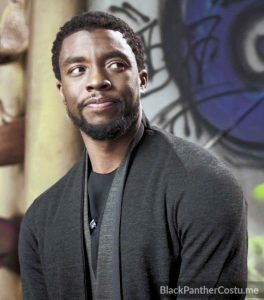 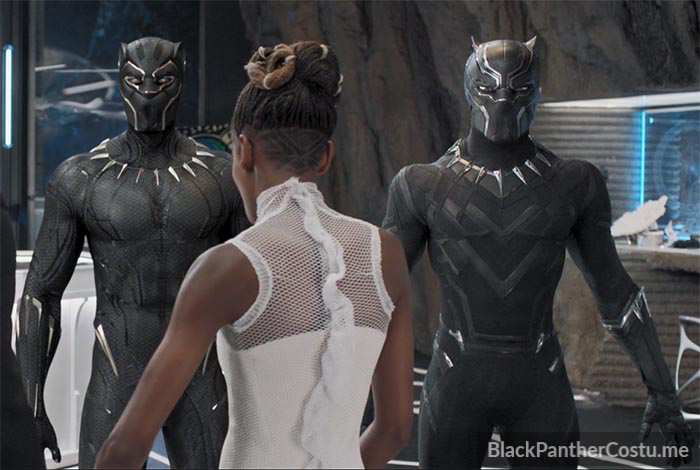 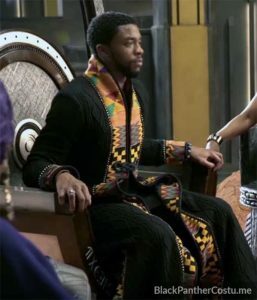 Later in the film, Shuri introduces T’Challa to his new suit, which has a triangular pattern and purple digital veins. 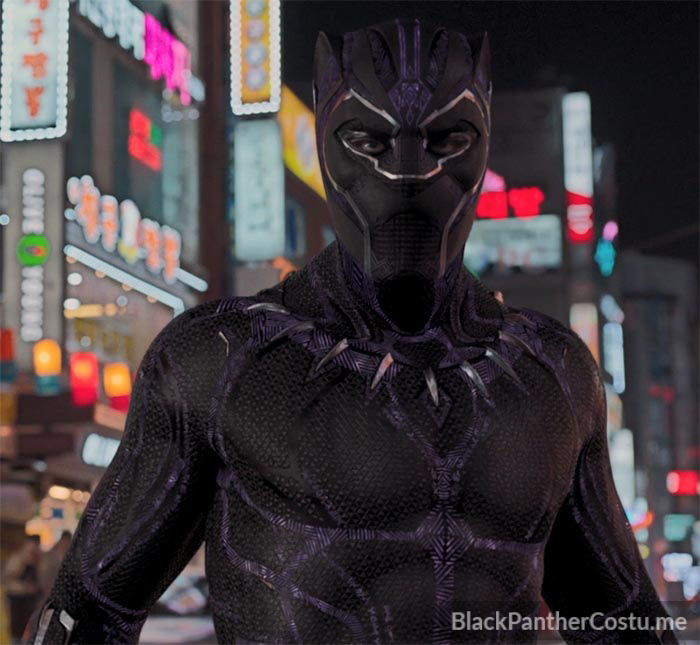 The fourth panther suit was worn by Killmonger and is sometimes referred to as the Golden Jaguar. 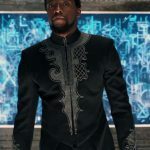 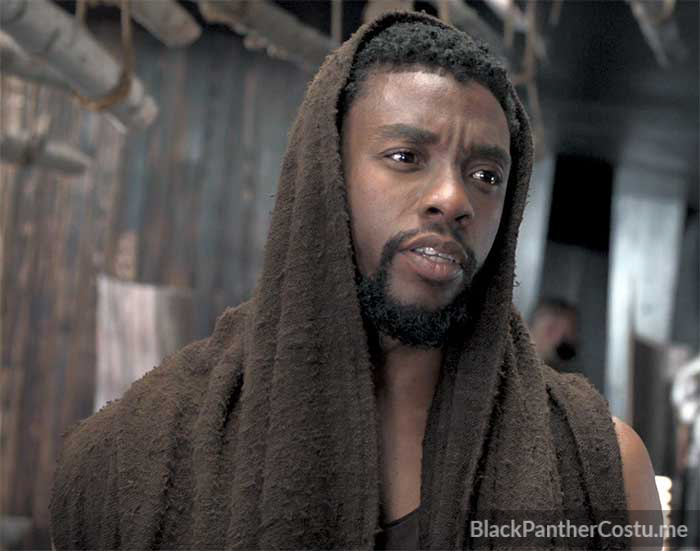 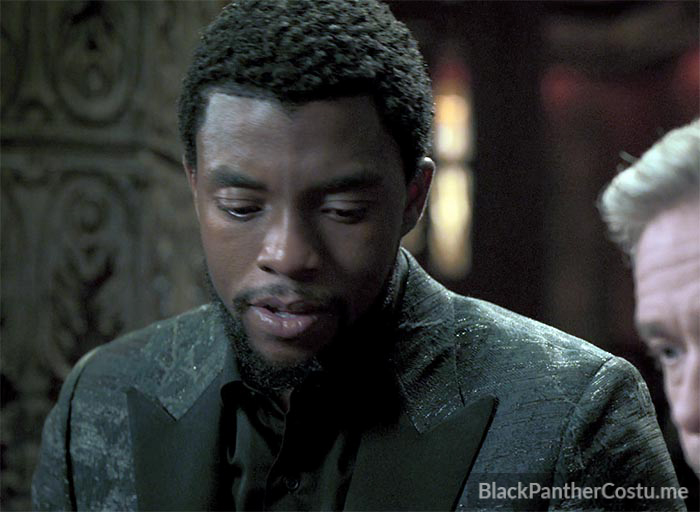 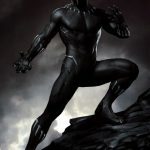 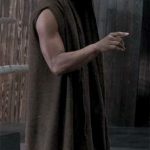 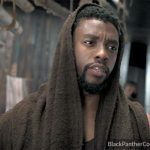 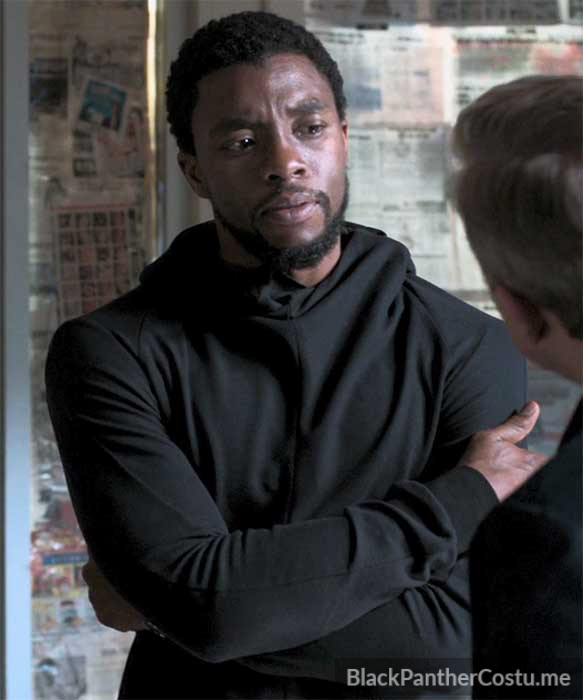 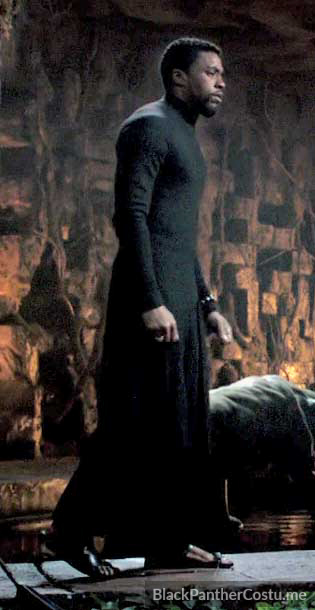 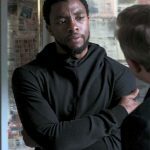 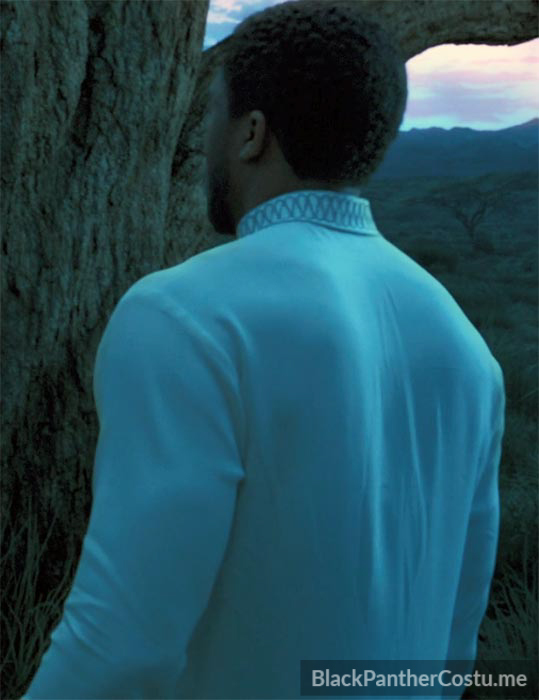 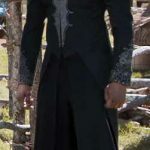 T’Challa wears his Civil War suit in the beginning of the film, during his trip to extract Nakia from her Nigerian spy mission. 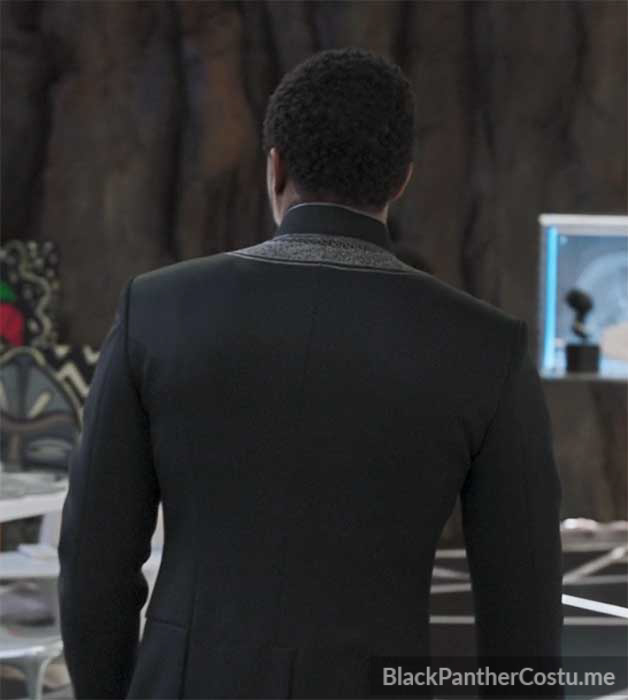 The suit can be identified by its basket-weave texture, and chevron designs on the chest. 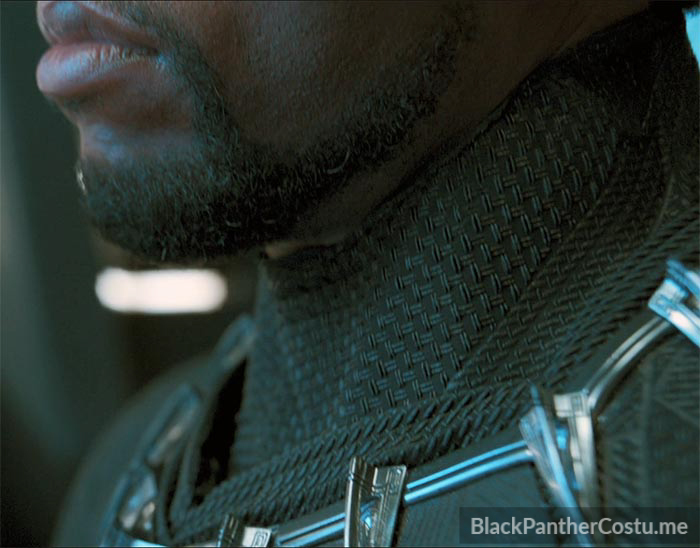 The silver teeth on the collar have a silver ring connecting them. 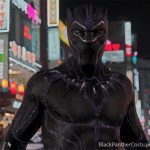 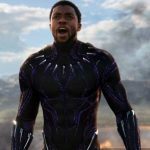 Buy a complete Civil War Black Panther Suit. 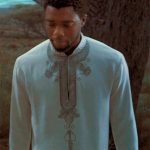 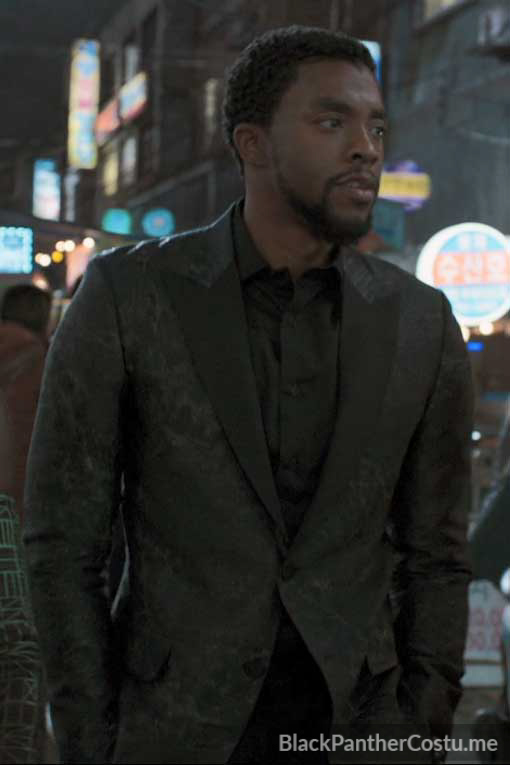 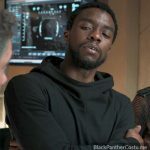 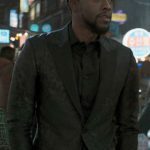 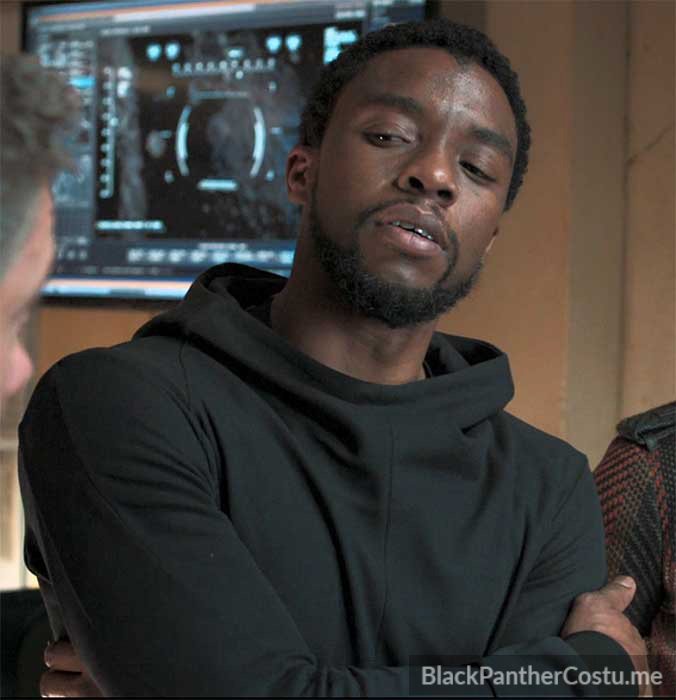 The New Suit is worn by T’Challa during the Busan chase scenes and during the final battle between T’Challa and Killmonger. 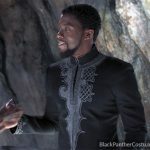 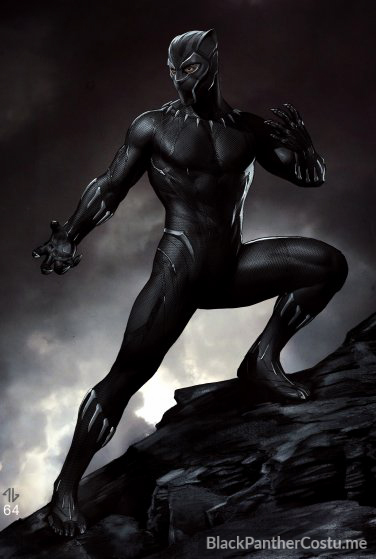 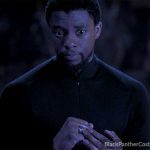 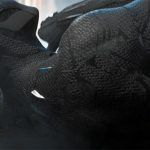 “Nowadays, every superhero suit seems to have a small pattern that creates a texture on their suit, so I was excited that there was an opportunity for me to include a surface treatment to Black Panther’s suit. 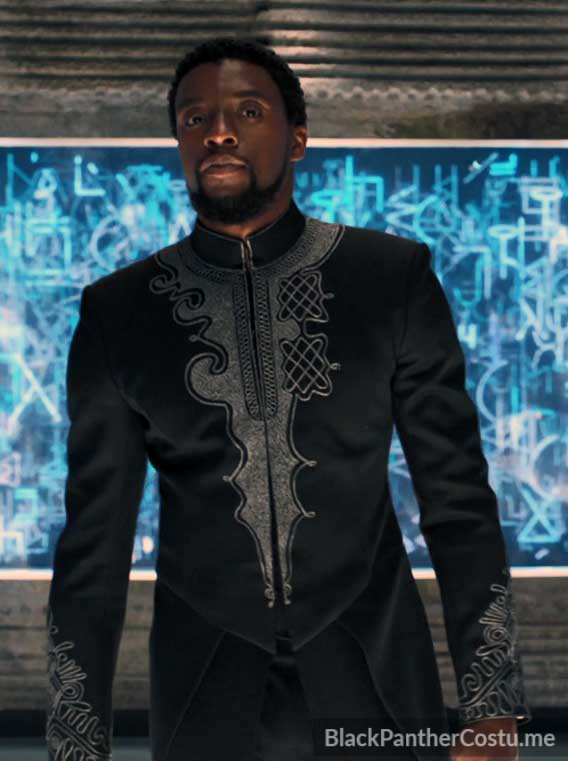 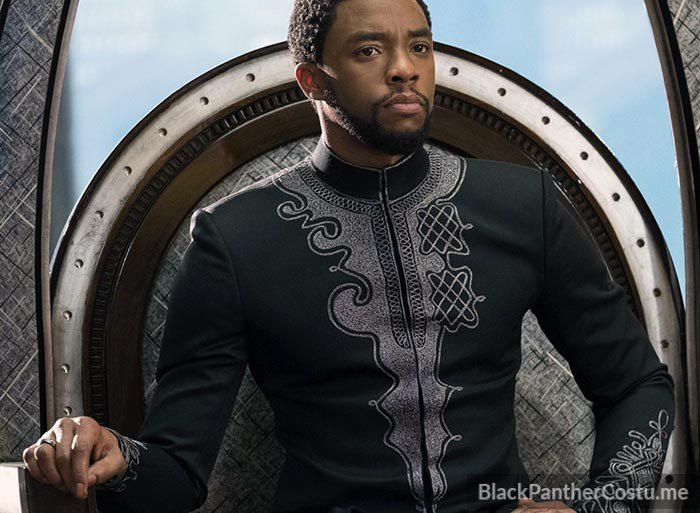 Within the design, you can see some veining of a Wakandan language that circles around the suit—but I put a small triangle in between the line-work. 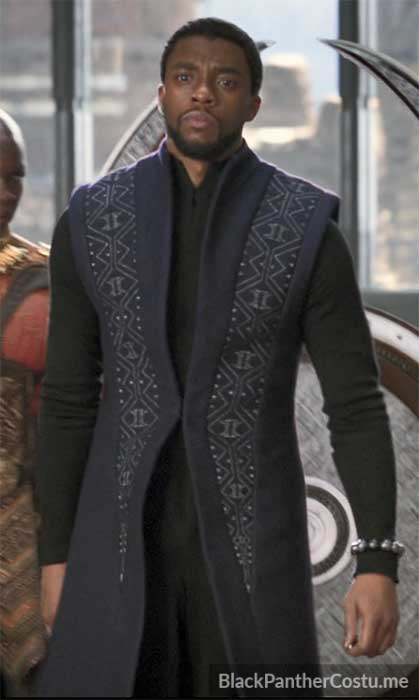 I call it the Okavango pattern. 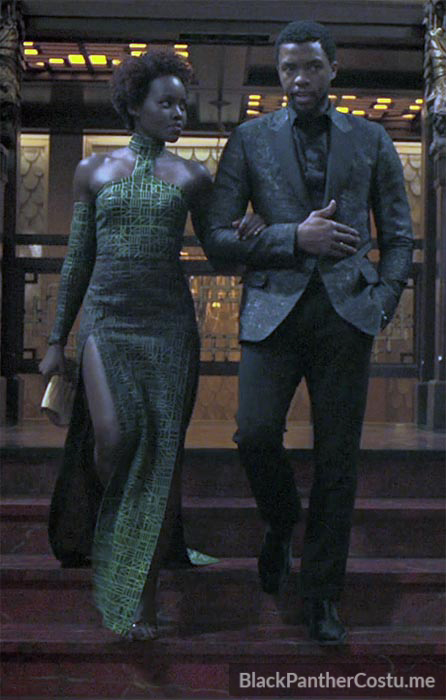 The Okavango print, in combination with the veining, helps the piece feel like the roller prints you see in so many African patterns and printed fabric. 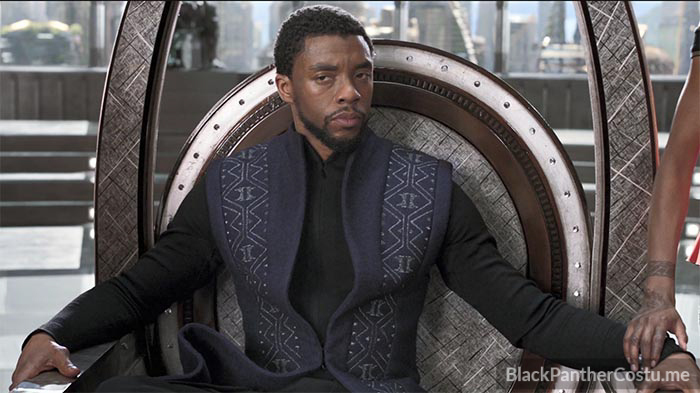 Now, he’s not only a superhero, but he’s also an African king. 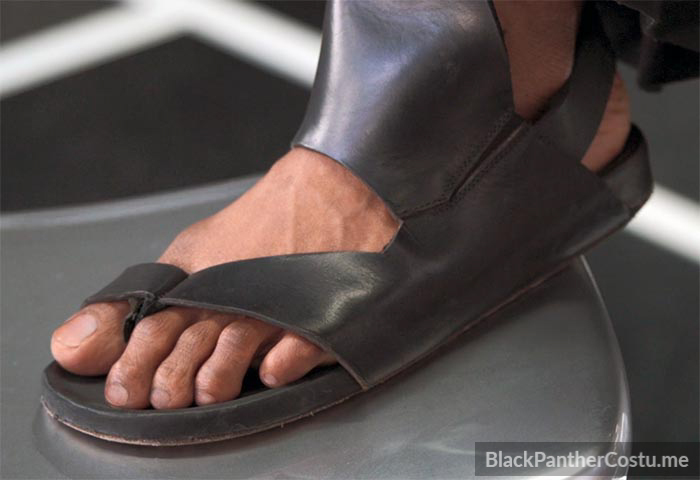 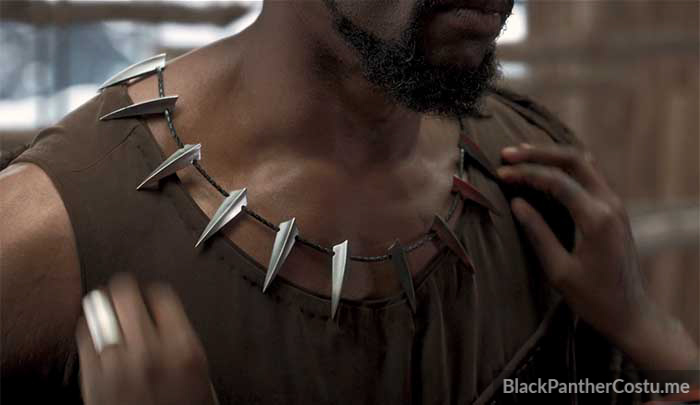 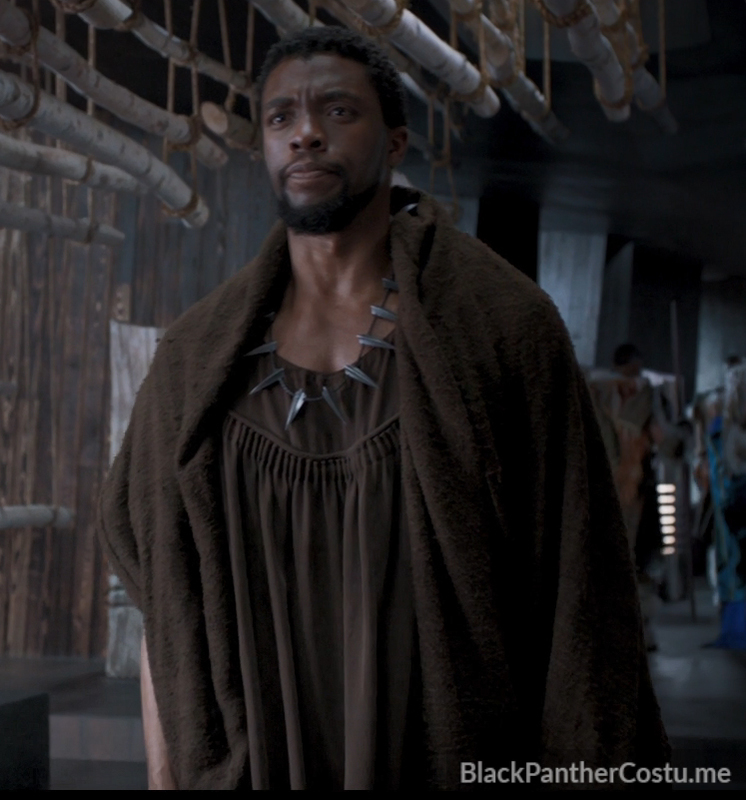 For the coronation ceremony, T’Challa wears nothing but a loincloth and clay makeup. 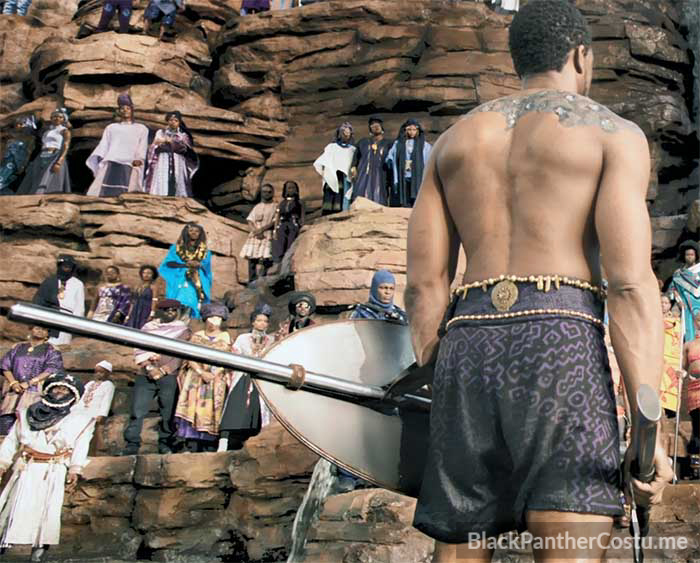 The loincloth appears to be black shorts with purple designs hand-painted onto them. 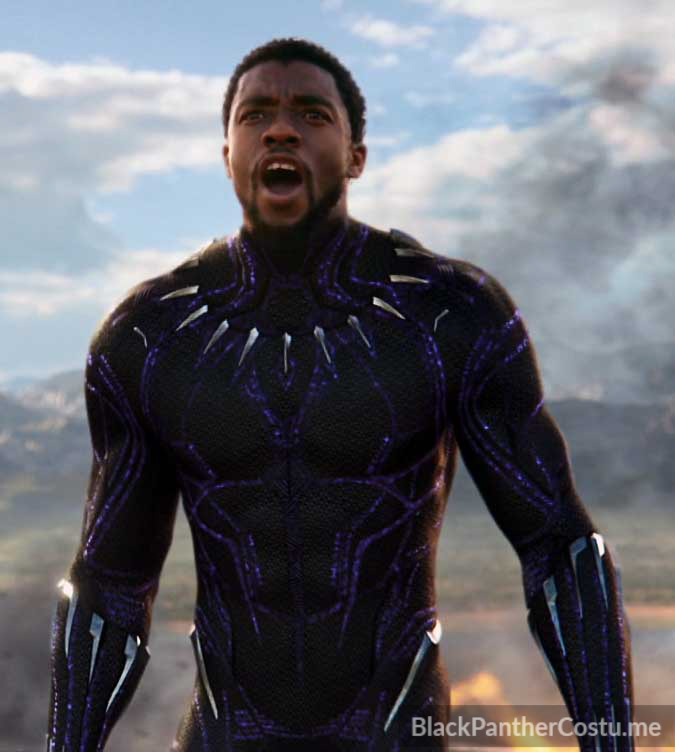 There is a waistband and a tabard on the shorts made of a purple fabric (that almost looks like black fabric with purple paint dry-brushed onto it). 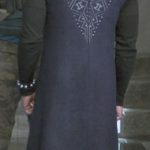 Both the waistband and tabard are bordered with gold beads. 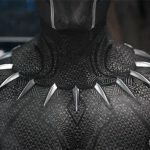 The waistband has a few gold-colored metal disks sewn onto it, as well as some fang-like pendants along the top bead line. The clay makeup consists of 3 gray lines on his face, and a mantle of gray clay with a leopard pattern in white and black. 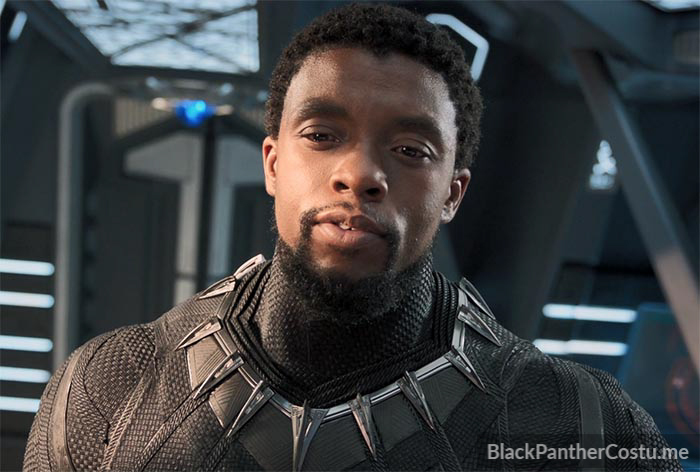 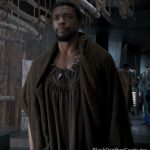 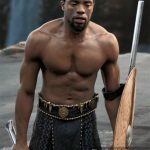 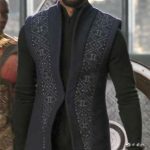 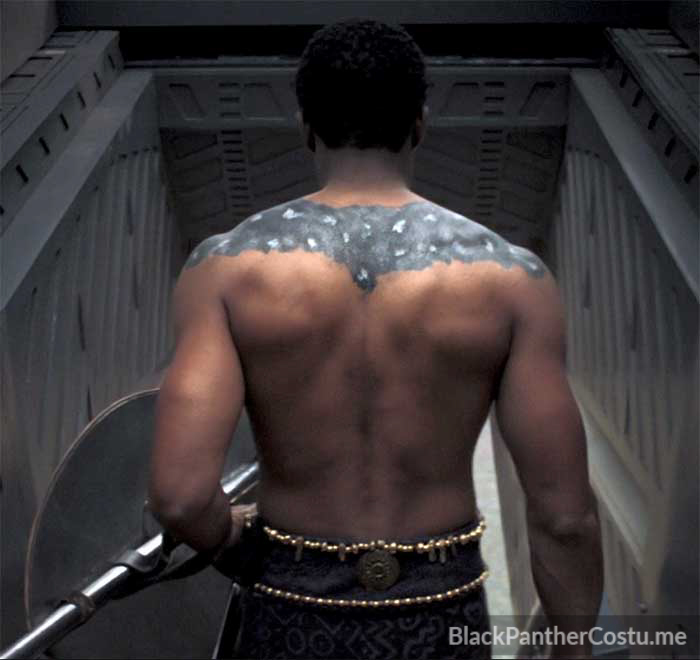 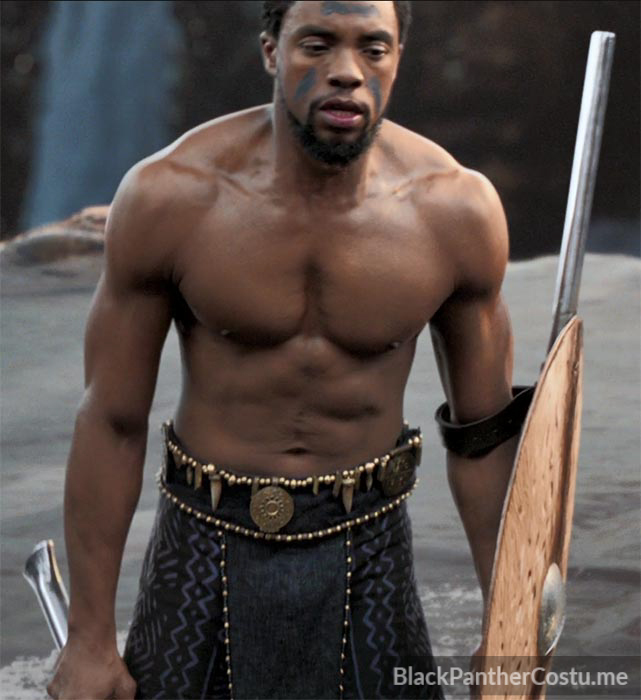 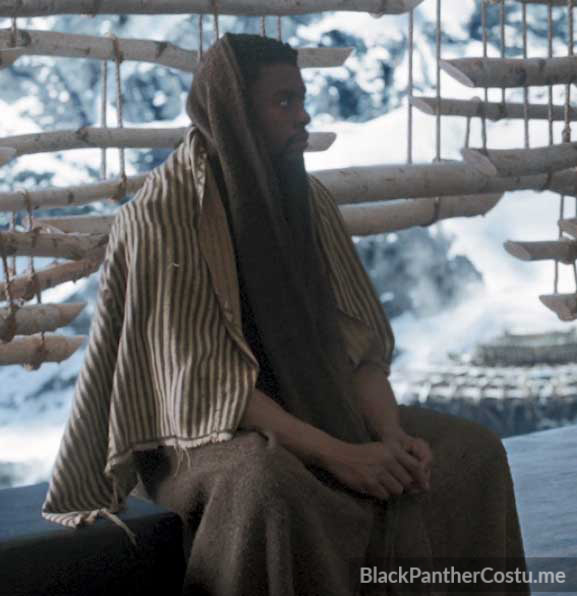 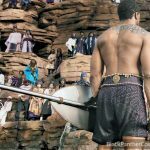 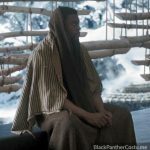 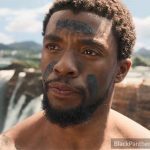 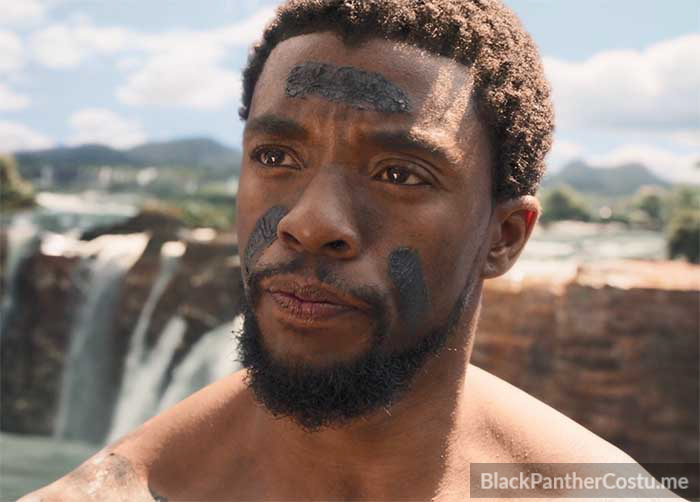 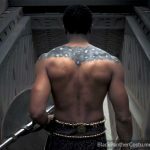 During the challenge with Killmonger, T’Challa wears the same loincloth, but doesn’t wear the makeup. 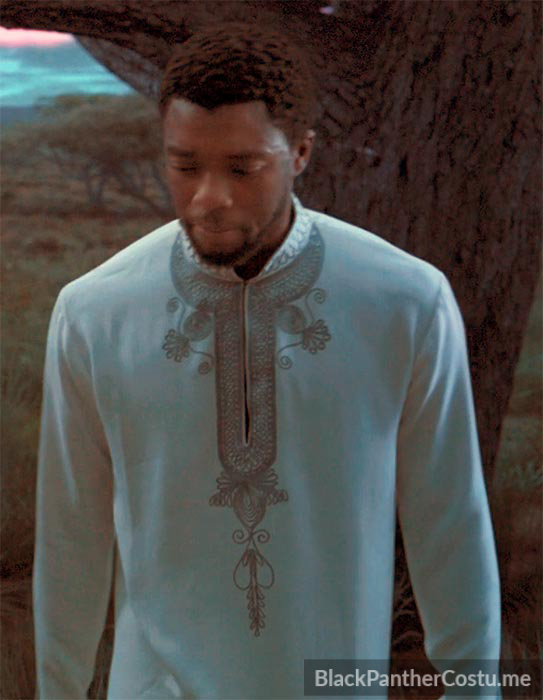 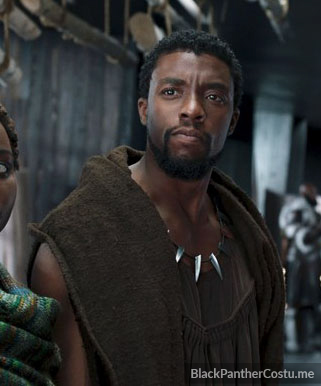 T’Challa carries a Zulu umbumbuluzo cow-hide shield. 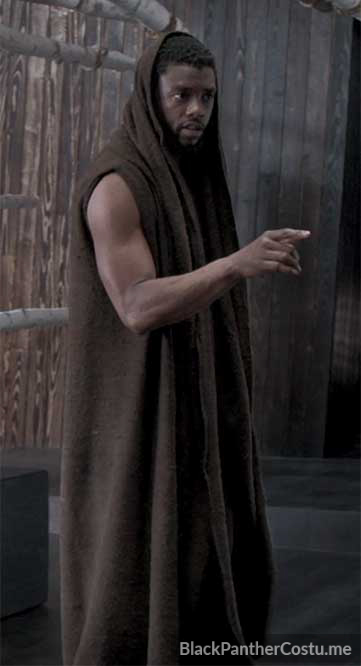 Zip-up black robe that he later wears with the purple/indigo vest.